I just finished upgrading my last Mac. My wife’s early 2011 MacBook Pro was really starting to show its age. The full 320GB hard drive was making this computer inoperable and needed to be replaced. 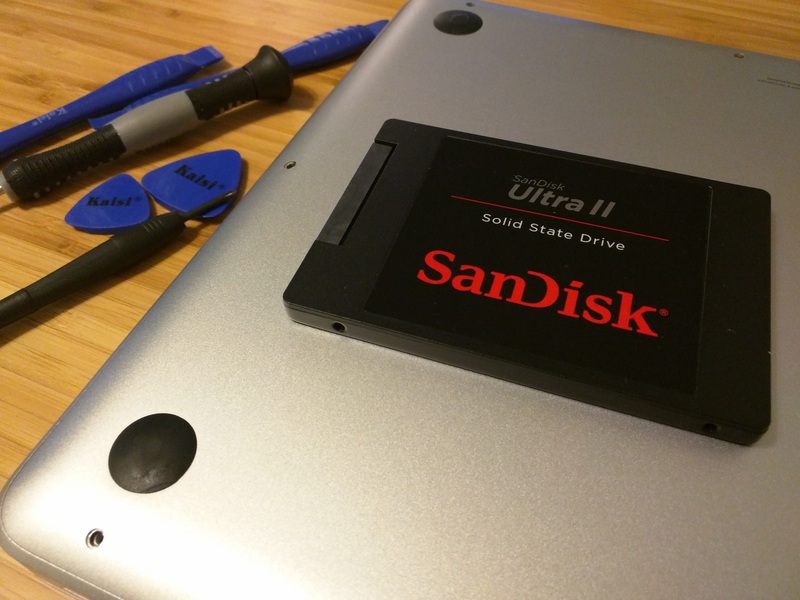 To breathe new life into her MacBook Pro, I added a massive 960GB SSD. I wanted to kill two birds with one stone here: triple her total storage and increase her computer’s performance. Download the El Capitan installer from the Mac App Store. Install El Capitan to the SSD (using the mentioned cable to mount the SSD). After the installation is completed, setup OS X on the SSD. I used the Migration Assistant to move all of the data from the original hard drive to the new SSD. Replace the old hard drive with the new (now identical) SSD. After the new SSD was installed into the 2011 MacBook Pro, I booted up the machine to make sure everything was working properly, then immediately enabled TRIM for the new SSD since I wanted this hard drive to perform optimally for the next few years. The guide from OSXDaily provided me with clear instructions on how to do this. At this point, I was finished with her 2011 MacBook Pro, my last Mac to upgrade. Why is this my last Mac upgrade? Mac upgrades have always been a big part of my life. Lots of Macs have seen RAM upgrades (more appropriately: maximizations) by my hands over the years. But, we are at a turning point. We are coming to the end of the era of (easily) upgradable Macs. Many of the newer Macs do not allow access to internal components like they once did. In most cases RAM and SSDs are soldered directly onto a Mac’s mother board. Combine this with several Apple computers that are difficult to upgrade, and there are now very few Macs that are upgradable by non-professionals. As the few remaining serviceable Macs are aging, I wonder how much longer these computers will be supported by Apple. Very soon, the components of most Macs (possibly excluding the Mac Pro) will have to last for the entire life of the device. There is a tradeoff in this new era of non-serviceable Apple computers. No longer will I have to worry about upgrading computers, but at the same time, I will lose the valuable learning experience of servicing a Mac. Not to mention having to pay a premium for the permanent parts of any Apple computers I purchase upfront—I hate to imagine the price of a 960GB laptop SSD in 2011…. This moment is rather melancholy. Although I am excited to bump my wife’s spinning hard drive to a newer solid state drive, I am saddened by the fact that I may have just finished my last Mac upgrade.